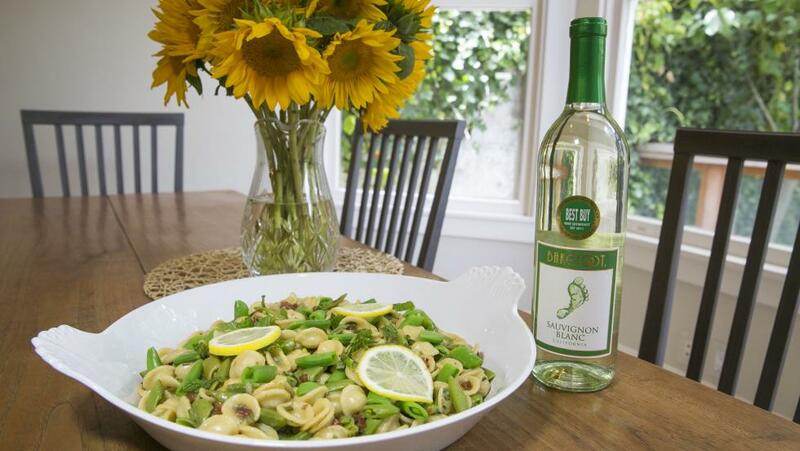 At Barefoot, we're all about family dinners made simple. That's why we've created this One-Pot Pasta recipe to be both tasty and easy! Its delicious combination of pasta, pancetta and peas, with hints of lemon and mint, is sure to leave satisfied smiles all around the dinner table. Perfect for your next summer BBQ or a candlelit dinner, it's a meal that makes every occasion toe-rrific. Gather all your ingredients and get ready for a savory adventure. In your straight-sided skillet, cook the pancetta in a tablespoon of oil over medium heat for about five minutes or until golden and crisp. Remove the pancetta, leaving only 2 tablespoons of fat in the pan and discarding the rest. Using that fat, heat the sliced onions for two minutes on medium-high heat. Introduce the garlic for only 30 seconds before adding Barefoot Sauvignon Blanc and cook for one minute (you might as well pour yourself a glass as well!). Add the broth, pepper flakes, 1/2 teaspooon of salt and some grinds of pepper, then bring it all to a boil. Lower the heat to a simmer, stir in the pasta, cover and let the ingredients mix together for 9 minutes. Uncover, add the peas and cook until the liquid turns into a sauce (about 3-5 minutes). The pasta should be al dente (cooked but firm) and the peas should have a crunch to them. Finally, remove from heat, add the pancetta, half cup of cheese, lemon zest and juice, a tablespoon of oil and the mint. Stir together and add salt and pepper as needed. Buon Appetito! Add whatever garnishes you like (lemon slices, a couple extra sprigs of mint, a sprinkling of Parmesan) and let your taste buds transport you to Italia! In a large, straight-sided skillet, heat 1 tablespoon oil with the pancetta over medium heat. Cook, stirring frequently, until golden and crisp (about 4-5 minutes). Remove the pancetta to a paper towel-lined plate. Pour off most of the fat, leaving about 2 tablespoons in the pan. To the same pan, add the onion and stir over medium-hight heat until barely browned (about 2 minutes). Add the garlic and cook, stirring, for 30 seconds more. Add the wine and cook for one minute, scraping the bottom of the pan. Then add the broth, pepper flakes, 1/2 teaspoon salt and a few grinds of pepper. Bring to a boil, then add the pasta and stir briefly to combine. Cover, lower the heat, and simmer with the lid on for 9 minutes. Uncover the pan, add the peas and continue to cook, stirring occasionally, until the pasta is just al dente and the liquid is reduced to a sauce that coats the pasta (3-5 minutes more). The peas should still have a bit of crunch. Remove the skillet from the heat, and add the reserved pancetta, half the cheese, the lemon zest and juice, the remaining tablespoon of oil and the mint. Stir to combine, taste for salt and pepper, and adjust as needed. Serve immediately with extra mint and a sprinkle of Parmesan.